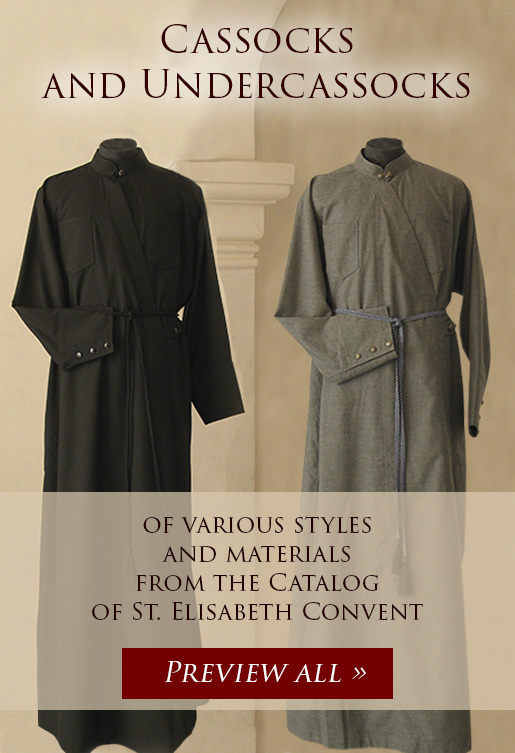 There is a lot to be said about the Icon Casing Workshop of St. Elisabeth Convent. First of all, there are a couple of questions that need to be addressed, e.g., “What is an oklad for an icon? What kind of meaning does it convey? 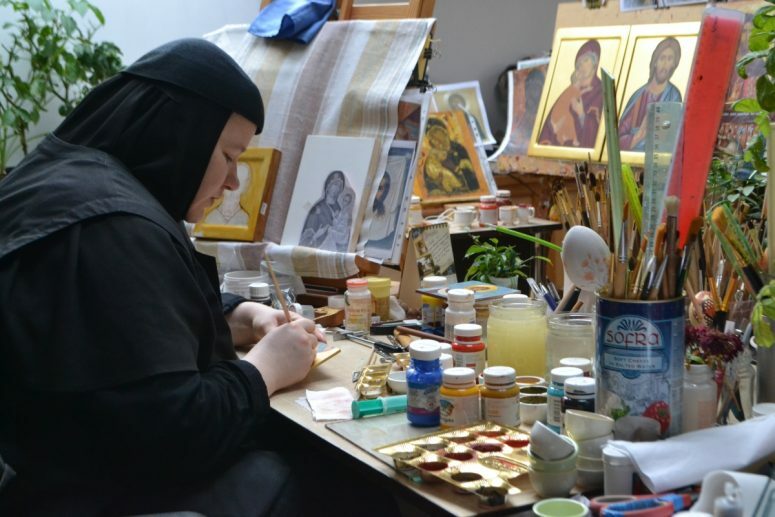 Do I need an oklad for my icons?” This post will address the most frequently asked questions about icon oklads and describe how they are made in our Convent in honor of St. Elisabeth. Riza, or Oklad (Greek επένδυση) is a metal cover protecting an icon pierced to expose elements (typically faces and hands) of the underlying painting. There are metal oklads, usually made of gilt or silvered metal (most often brass, copper, or white tin) with repoussé work. 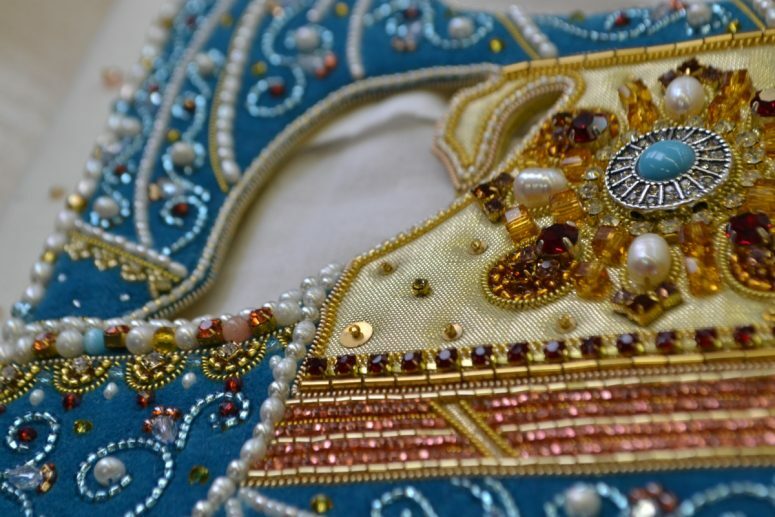 Additionally, there are textile oklads sewn with beads or pearls. Oklads are sometimes enameled, filigreed, or set with artificial, semi-precious or even precious stones and pearls. Their reverse sides are sometimes covered with red or crimson velvet. Icons were decorated with precious oklads to mark important events in the history of a certain individual or a family, a city, or a nation, as a sign of gratitude or to fulfill an oath. Church icons were covered in oklads either at once, thanks to one-time financial contributions of wealthy sponsors, or gradually, thanks to donations of simple parishioners. 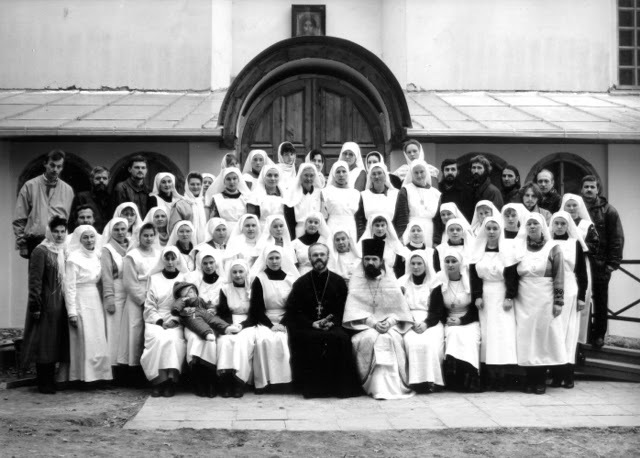 Oklads can be seen on Orthodox icons all over the globe, as well as on some Catholic icons (e.g., icons of Byzantine origin in some Catholic churches in Italy and some Central European and Eastern European countries). What meaning do oklads convey? What is the message that this quite rare example of church art carries? The shiny oklad represents a symbol of the saved soul that shines with purity (silver) and divine grace (gold). The gemstones, pearls, and color enamels that adorn the oklads symbolize the richness of a soul that possesses a multitude of spiritual gifts. The Seventh Ecumenical Council noted that the material (wood) of the Ark of the Covenant and the icon is identical. The Ark of the Covenant was overlaid with gold (And thou shalt overlay it with pure gold, within and without shalt thou overlay it, and shalt make upon it a crown of gold round about. Exodus 25:11). Likewise, icons are covered with gold oklads, too. An oklad is the symbol of the immaterial Light in which the saints dwell. 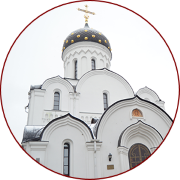 Floral ornaments made of wrought silver are widely used for decoration of some parts of the icon. They symbolize eternal bloom and point at the life-giving power of the Divine Light. Like icon painting, making oklads demands concentration, artistic talent, and creativity. However, the result is worth the effort. “A customer will purchase such an icon and then pass it to the next generation. 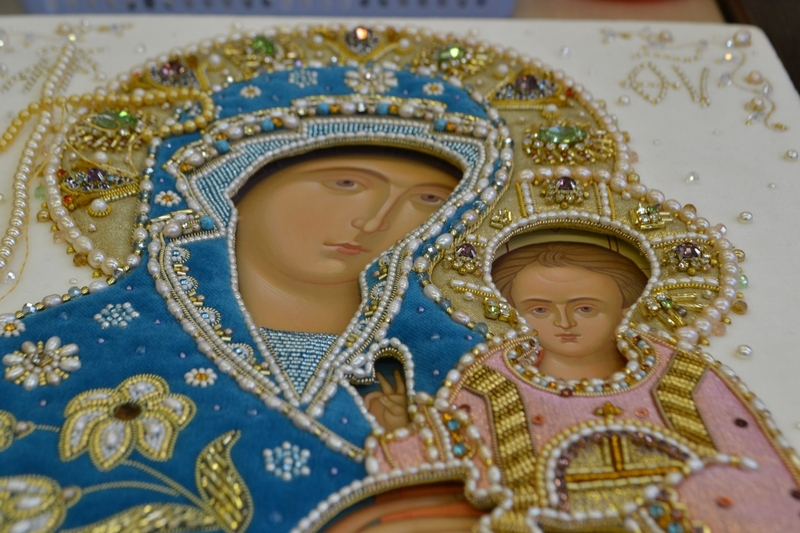 These icons are bought once in a lifetime and become a family treasure,” Anna, who works in the Icon Setting Workshop, says. 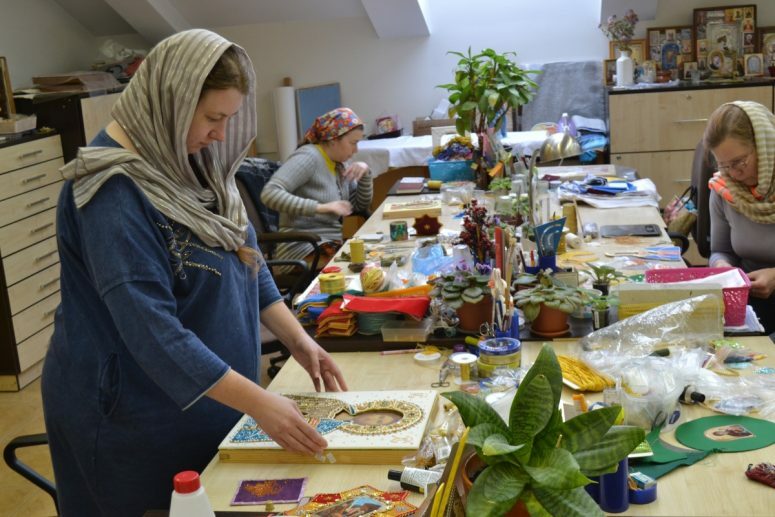 You can see her on the photo embroidering oklads for the icon of Christ the Savior and Our Lady of Kazan. “We use premium-quality materials for oklads, so an icon will last for a very long time. We make each oklad with extreme caution, even though it takes weeks to make just one item. First, we copy an image from an icon to a sheet of tracing paper. 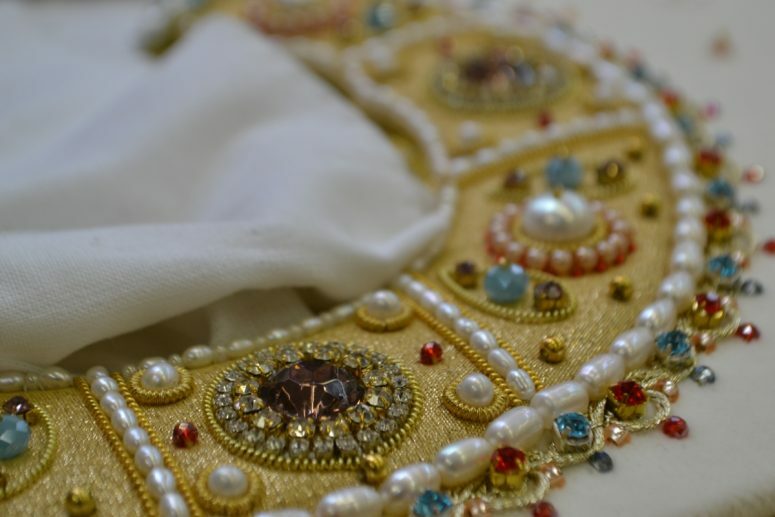 Then we glue together several layers of fabric (calico, thick cloth, and linen), then seal them over with velvet, and then cut out the shapes and begin to embroider the oklad with pearls, precious and semiprecious gemstones, strasses, and onlays. An oklad is usually made by one craftperson, while shrouds are often embroidered by two or even four persons. 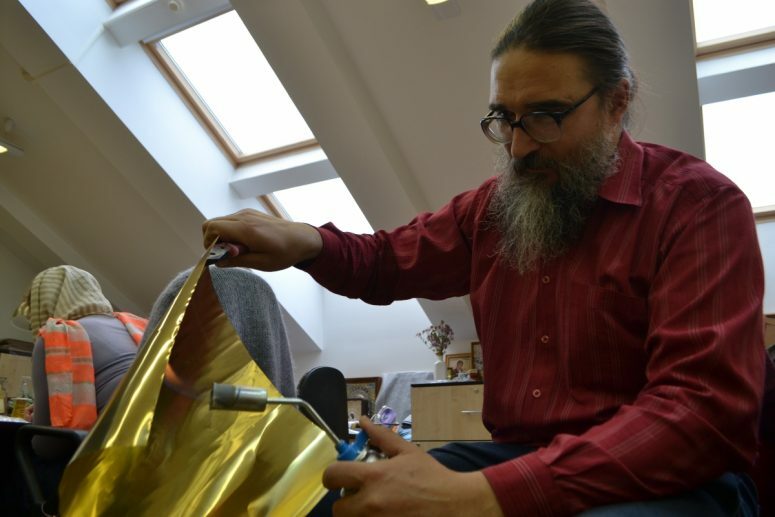 Brother Maxim is busy making a metal oklad. First, he heats up brass to make it more malleable. He uses special tools to chisel patterns and ornaments of the halo and the backgrounds designed specifically for every icon on a brass sheet. 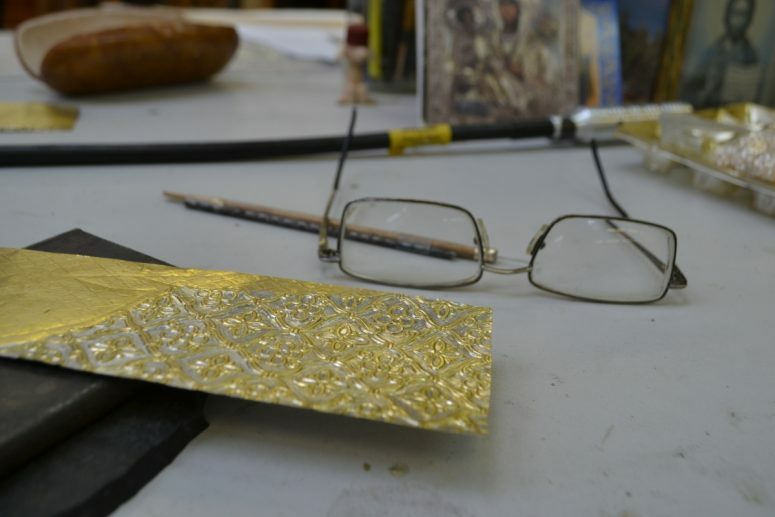 The picture shows the process of making metal oklads for icons of St. Poemen of Ugresha and Holy Righteous John of Korma. 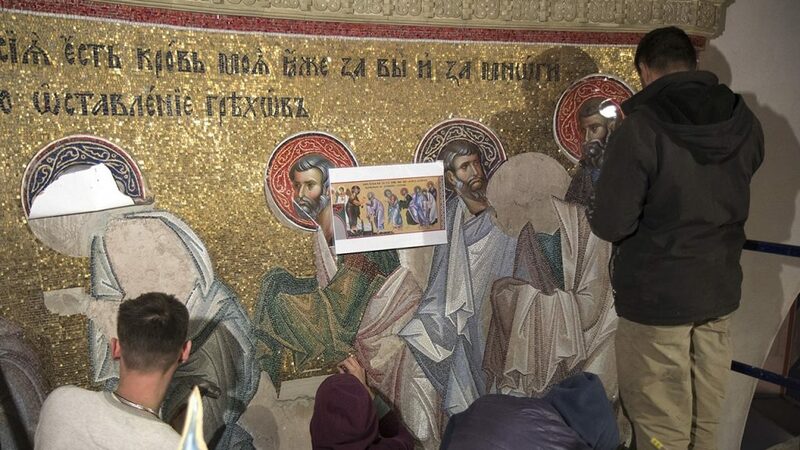 It must be noted that our craftspeople mastered the art of icon painting earlier than the art of making oklads. That is why, at the customer’s request, our artisans paint a full iconographic image first (not limited to the visible parts) and then craft an ornate oklad. If necessary, the fully-painted icon can be exhibited without the oklad. Sometimes, our experience in manufacturing oklads for icons can be used to solve extraordinary creative tasks, such as design and manufacture of Christmas Stars for theatrical performances both on a professional stage and at home. 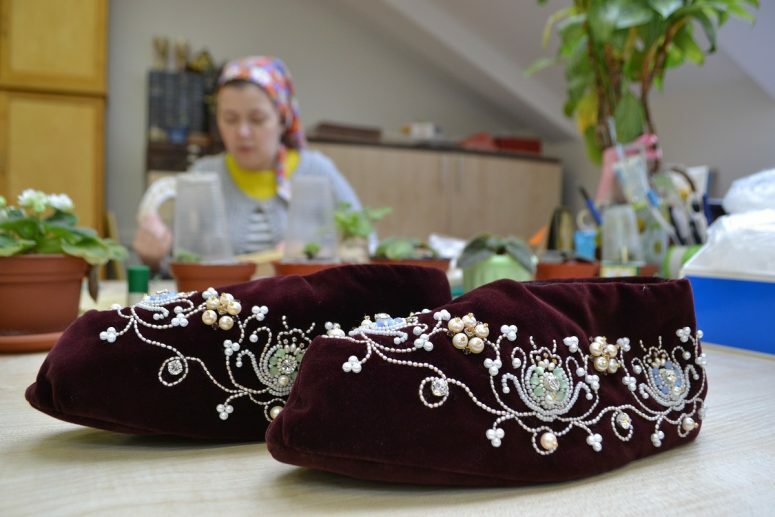 Once, our workshop received an order to make slippers for the relics of Saint Spyridon of Trimythous! If you know anything about that saint, it is the fact that they put on new slippers on his incorrupt relics several times a year. When our Convent was granted the chance to participate in that fascinating and very impressive project, our artisans started doing this work with great joy and love. Unfortunately, we didn’t know the exact size, so the slippers returned to our workshop. 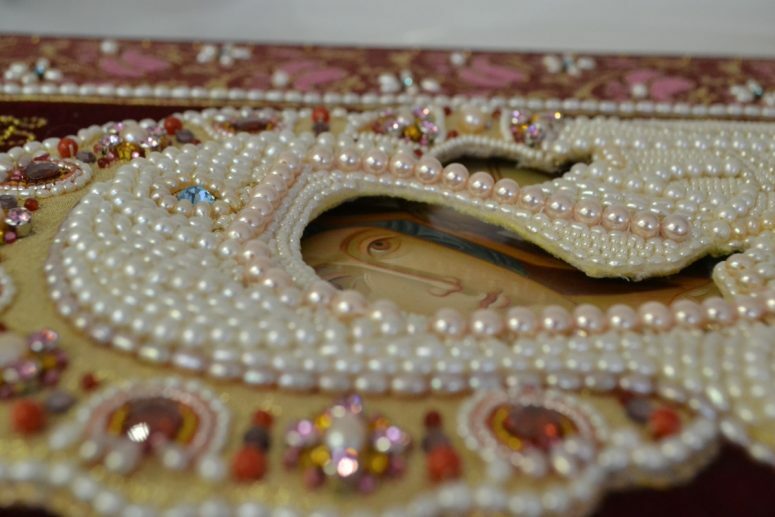 It could feel like a disaster if there wasn’t a piece of cloth from the relics of St. Spyridon bundled with them. 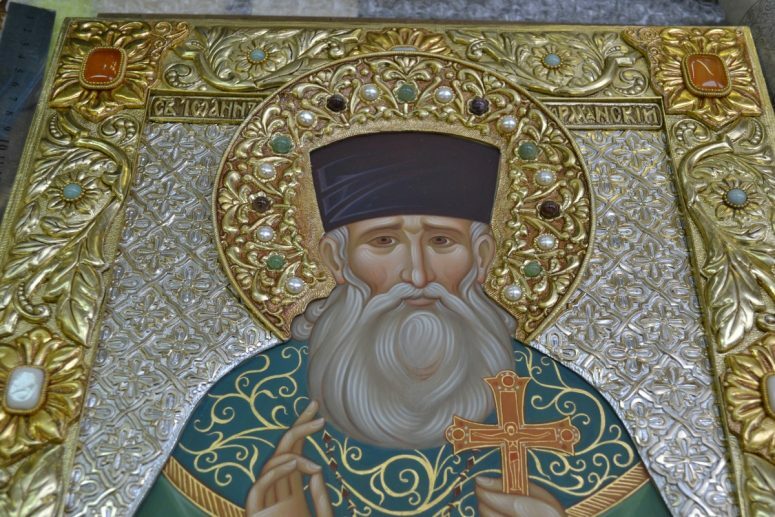 We planted that sacred object into the icon of St. Spyridon of Trimythous, which hangs in our workshop. 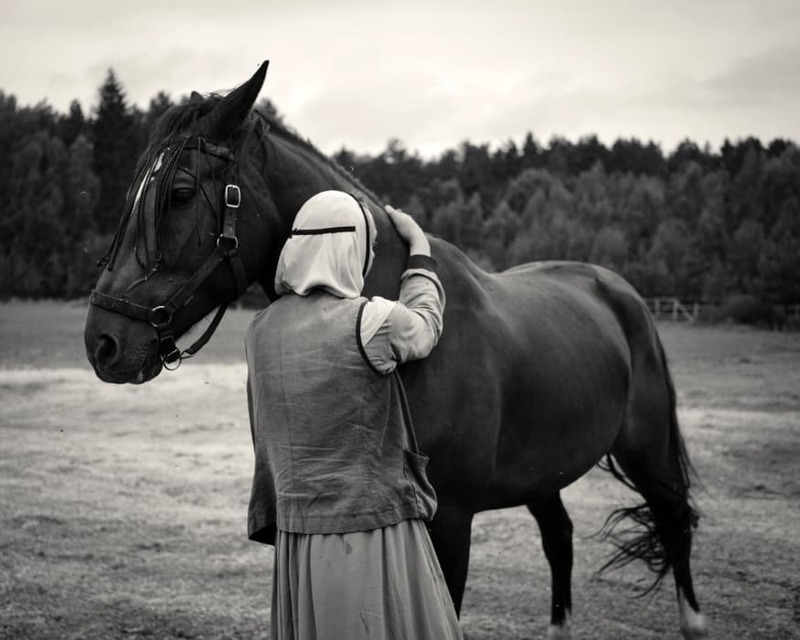 That was how the holy hierarch comforted our staff with a small but valuable gift. 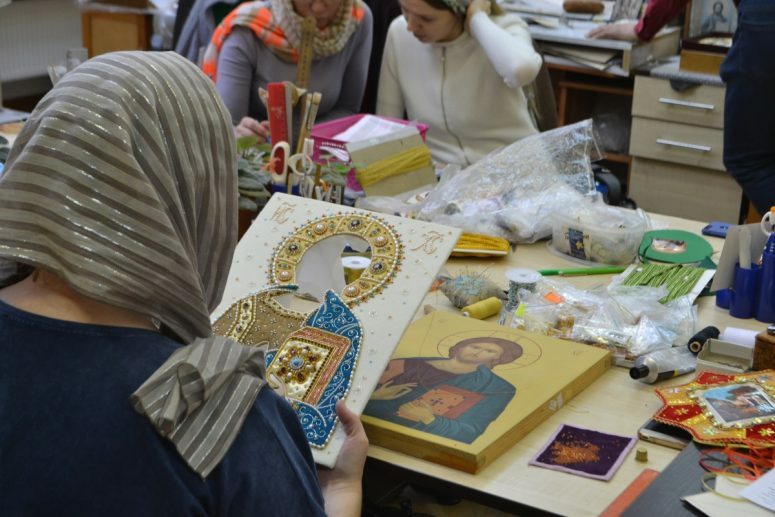 That’s the engaging and unique craft done in the Icon Setting Workshop of the Convent in honor of Holy New Martyr Elisabeth in Minsk. 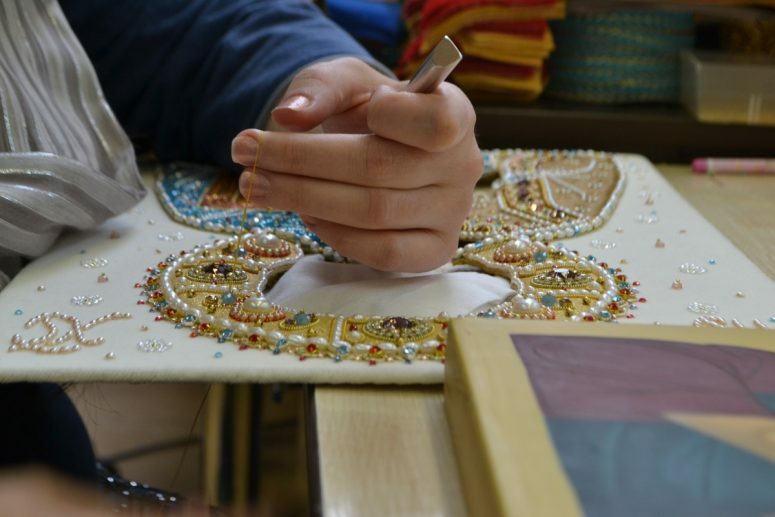 Combining modern approaches to ancient traditions, creative work and prayer, our craftspeople make unique items that can become a wonderful decoration of your homes and churches.